Loren D. Estleman has garnered heaps of praise for his stylish novels, which are charged with razor-sharp wit and sparkling dialogue. 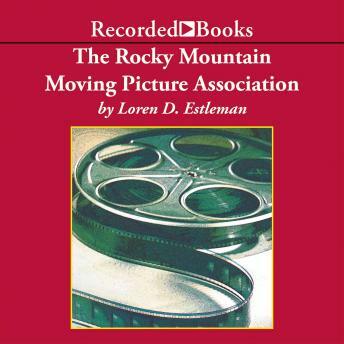 The Rocky Mountain Moving Picture Association, reminiscent of the author's Mister St. John and The Stranglers, is an engrossing story of California's colorful past. In 1913, Dmitri Pulski wants to be the next Jack London. He spends countless hours at his father's ice company in a shed, writing short stories. When sent to Los Angeles to investigate an unusual order, Dmitri changes his name to Tom Boston and immediately begins scripting movie scenarios for a rogue film company. In the days to follow, the company will find itself fighting Thomas Edison and his cronies for control of the burgeoning film industry. This is an extraordinarily clever tale set against the boom of America's movie capital - Hollywood. Estleman's magical lyricism and masterful storytelling are at their usual high standards, matched here by the incomparable skills of veteran narrator George Guidall.